1992 Language Theory and Translation Practice Halliday, M.A.K. 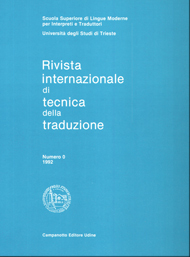 This first pilot issue of the 'Rivista internazionale di tecnica della traduzione' (N°0) is a review designed to meet some of the requirements expressed during two recent and extremely important conferences held here in Trieste: the first, 'Autori e traduttori a confronto', was a meeting between two internationally renowned ltalian authors, Umberto Eco and Claudio Magris, and their many translators who have provided target versions of 'Il nome della rosa' and 'Danubio' in a multitude of languages; the second conference, 'Editori e traduttori a confronto', organized along similar lines, created a forum of discussion between translators (literary, sci/tech and lexicographical), their professional associations and major publishing houses on the many problems existing in this relationship and particularly on how to reconcile working conditions, deadlines and remuneration with translation quality. 1 "Il professore va al congresso"